"For years I had just enough of God to make me miserable", writes Elaine Martens Hamilton. After examining the relationships that left her disillusioned and disappointed, Elaine concluded that her journey with God is the one relationship that heals all the others. Leaving the Mud and Learning to Fly shares that journey in a rich blend of allegory, prose, and personal accounts from women who have struggled with difficult relationships. The journal format invites readers to interact with God's Word and their heavenly Father. For individual or small group use. 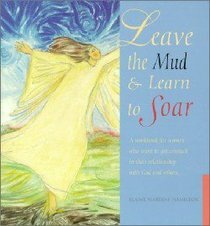 About "Leave the Mud and Learn to Fly"
Elaine Hamilton (MA, Bethel Seminary) is a licensed marriage and family therapist at Family Consultation Service in San Diego, California. She is a speaker at a number of womens and marriage retreats and has previously worked in youth ministry. She is the author of Come With Me: An invitation to Break Down the Wall between You and God (coauthored with Kathy Escobar) Leave the Mud and Learn to Soar: A Workbook for Women Who Want to Get Unstuck in Their Relationship with God and Others and Church on the Couch: Does the Church Need Therapy?